It's great when crap that's lying around your house actually makes you some money...especially if it's Doug. Seriously dude, stop picking out all the Crunchberries and get a job. Helping to monetize the rest of your stuff: SnapGoods.com. 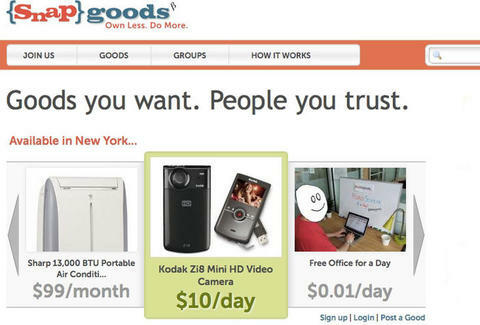 With an expressed goal to "promote community, access, and intelligent ownership", SG's lets users earn coin via loaning their unused items/leftover junk to neighbors for a small fee, an arrangement they liken to "timesharing", probably because they loaned out their dictionary before getting to "renting". Users upload their goods and designate a daily/weekly/monthly reservation fee, the security & hold deposit amounts, and an availability calendar (plus whether the goods're avail to the general public or only friends/groups); those in need can peruse a feed of what's available nearby, complete with said deets and the pick-up location, which as a back-up can be the SnapGoods HQ in Brooklyn, in case you don't trust your transaction partner to Do The Right Thing. NYC's menu of "snappetizers" is currently heavy on electronics (You-Vision Video Glasses, a Wii w/ nine games, an iPad), plus household gear for the kitchen (waffle maker, Cuisinart) and the garage (handtruck, power drill); more miscellaneous stuff includes a Roland XP-60 Music Workstation synth, various camping equipment, and a batch of tools for a seafood boil, the very event to attract...a batch of tools. You can also join groups focused on specific areas of town or interests like snowboarding, or eating exclusively Crunchberries. Yeah Doug, it's nearby. No, you can't have cab money.